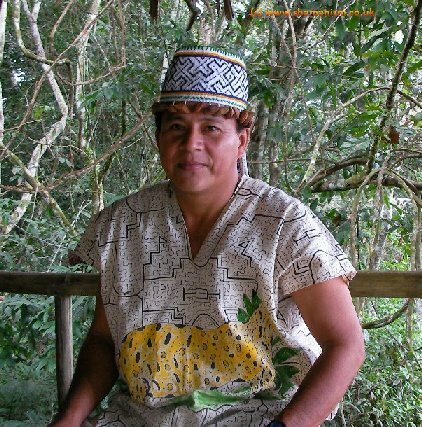 An interview with Shipibo Shaman Enrique Lopez. Interviewed at Mishana, Amazon Rainforest, Peru, November 2007, by Peter Cloudsley and Howard G Charing. I was born in a Shipibo community called Roaboya which is on the River Ucayali about 10 hours downstream from Pucallpa. Roaboya means the place where the Koto monkey lives. In Shipibo this kind of monkey is call Ro, but Mestizos tend to lengthen words, so they called the place Roaboya. The first Mestizos to arrive in the area were loggers – Boya (Buoys in English) refer to the logs which they floated down to their saw mills. Actually there are two places; Roaboya Nativa and Roaboya Mestiza a bit further down river. When I was young, Angel Sanchez Vargas was the local Curaca – who is both a chief as well as shaman – he was my grandfather and he knew all about plants for healing, for giving visions and increasing human intelligence. They later named the school after him there. Roaboya was the first indigenous community to be officially recognized 114 years ago. Later the river changed its course and the banks crumbled and many Shipibo people moved to form communities elsewhere on the Upper and Lower Ucayali. When the earliest missionaries came in the 1940s, at first the people didn’t want to know about their pharmaceutical medicines or clothes which they tried to give away. The Shipibo didn’t wear Western clothes at that time and even refused to meet with them. But the missionaries were clever and brought sweets and presents, and impressed them with their water-planes and eventually succeeded in introducing their evangelical religion. The effect was to threaten Shipibo customs and create divisions in the community. Later in the 60s when I was in my infancy, my grandfather put up resistance to Western things and warned that his people should not forget their customs and ancestral knowledge. He forbade the use of Western clothes, and encouraged people to eat together from one central plate as a community. His four wives were also shamans and helped to revitalize their traditions. Don Angel even learned Spanish through his plants, such was his faith! Nevertheless, today most of the Shipibo in Roaboya are nominally evangelicos. After he died, his cousin took over as shaman and he wanted me, at the age of 10, to help at ayahuasca sessions by smoking mapacho for protection while he chanted. I told him I wanted to be a womanizer when I was grown up! And he made it happen by chanting a Huarmi Icaro. I also want to be a good fisherman and again he said yes, I could be, and so it was. By the time I was 14 it had come true, and I had women coming after me! However, I didn’t want to marry at that time. At the age of 16 I started taking ayahuasca, but my Mother didn’t want it – a womanizer can’t be a good shaman she said. Only when you learn to follow a proper diet can a person serve. This is the test that the plants give us. It has happened to me twice, a woman comes just when you are working and wants to make love. You can’t, if you give in just once you will fall ill, go mad, fall into the water, or die – these are the tremendous problems of being a shaman. At the age of 16, I started my first diet for 3 months, without ayahuasca, only plants, no drink, women, salt etc. After that the shaman called me and said I could go further and he chanted for me. Then I did another 3 months’ diet, again no ayahuasca, but the plants made me dream of what I should eat, how I should live, to not to go out etc. It is important to avoid women who are menstruating, or who have made love the previous night, that is bad with the plants. It clashes, like a mirror smashing; it makes you ill or goes against you. Howard G. Charing, is an international workshop leader on shamanism. He has worked some of the most respected and extraordinary shamans & healers in the Andes, the Amazon Rainforest, and the Philippines. He organises specialist retreats to the Amazon Rainforest. He is the author of the best selling book, Plant Spirit Shamanism.